Do you remember the tv show Are You Smarter Than a 5th Grader? 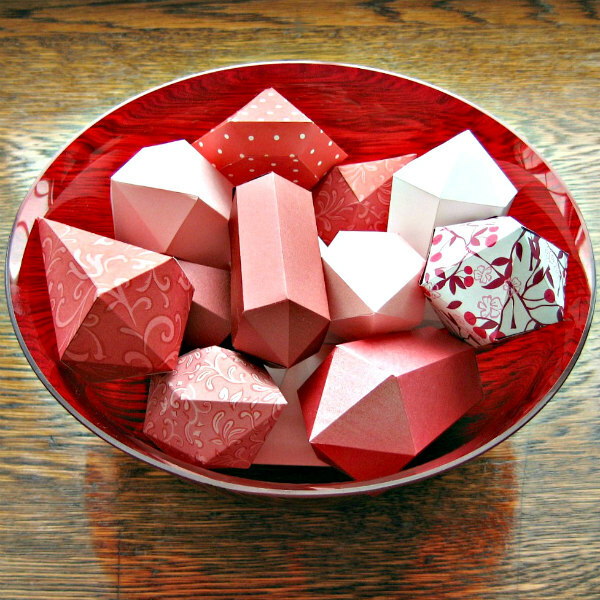 In all honesty, for years I'd steered clear of making these folded paper gems created by Kate Lilley of the wonderful site Mini-Eco, thinking they would be difficult. But perhaps last month's origami ornaments bolstered my confidence or maybe it was because I noticed an 11 year old had commented on Kate's post that he found them easy. Yes, that was it... if a 5th grader could make them, so could I! Surprise, surprise... these pretty gems practically fold themselves and are so.much.fun to make. 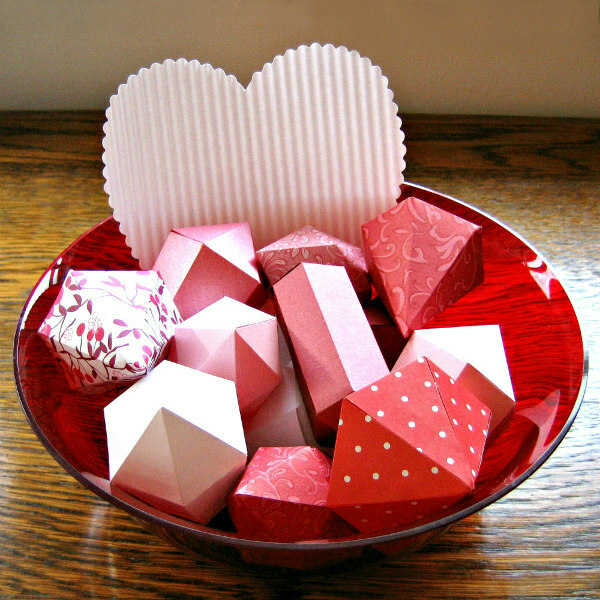 In just an afternoon I had filled a bowl as a Valentine's Day decoration. While cutting and folding, I jotted down a few tips in case you too are on the fence about making a batch. 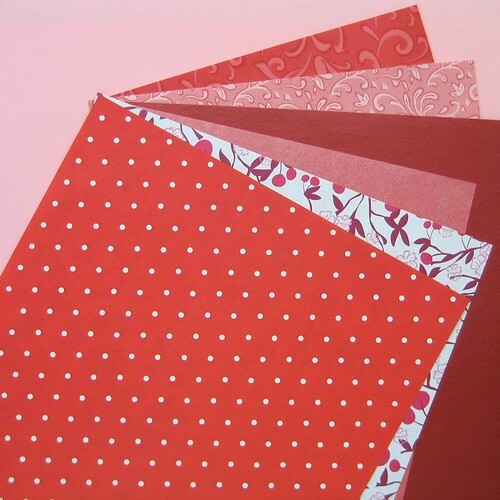 There are five templates to choose from, each comes in two sizes... I tried all of the smaller ones and honestly can't choose a favorite. 1. 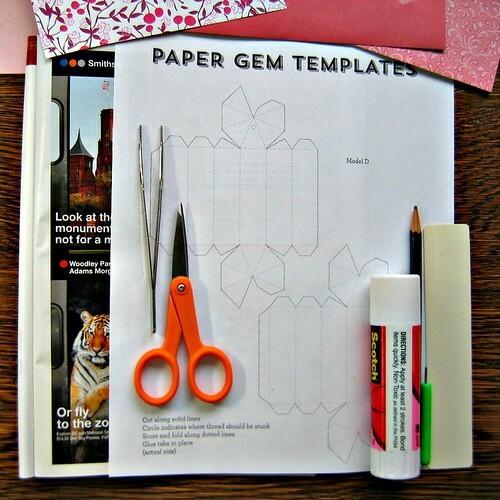 Print a template on printer paper, cut it out and trace around it on paper of choice. Score lines, referring to printer paper template, fold, and glue. 2. Place printed template paper on top of paper of choice and score both sheets at once. 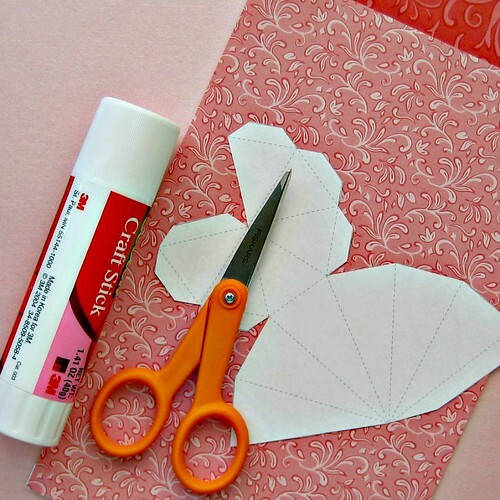 Cut out the scored paper of choice version, fold, and glue. Keep a damp cloth handy on which to wipe glue from fingers... the process is less frustrating when you aren't sticking to everything in sight! Score with a metal edge ruler and bone folder if you have them. I used a plastic ruler and the tip of my slotted quilling tool as they were what I had on hand, but a metal edge helps to avoid slips and a bone folder is easier to grip. Speaking of hands, I found making these gems much more hand-friendly than origami. Two reasons: there are never more than two layers to press together and you'll be working with a light touch to not compress the shape. I think these gems would be pretty strung as a garland too, so I'm off to take more papers from flat to fabulous! P.S. 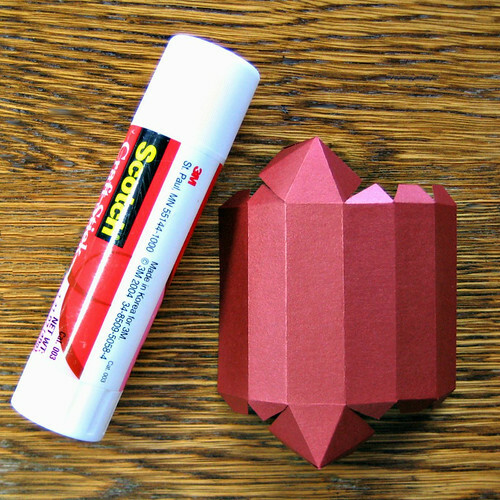 To make the corrugated heart in the first photo, I folded a square of printer paper in half and used scallop-edge scissors to cut half of a heart shape, unfolded the paper, then ran it through my hand-held crimper. These do look like fun...think I will try my hand at it...and love the corrugated heart, too....thanks for sharing. Ah it's projects like these that make me feel 10 years old, when my fingers just itched to seem them materialize in front of me. Thanks for sharing this Ann! I’m glad you found it too, Randy! Always happy to meet another paper crafter and yes, Pinterest is a happening place nowadays.